Fire Protection - How to plan fire protection? How to reduce fire risks? 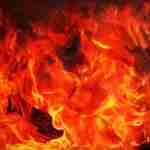 Fire Protection - How to plan fire protection? How to reduce fire risks? How to minimize fire hazards? All you need to know about fire protection. sprinkler systems should be automatic. 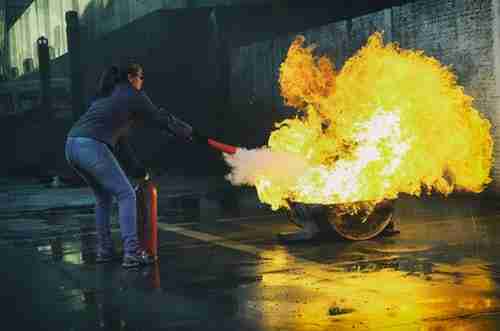 fire extinguishers, fire blankets and operating fire hoses require someone to use them. fire alarms can be triggered by people but can also be automatic. Passive fire protection. Passive measures are put into place around a building, like signs for fire exits, planned escape routes and refuge points. There are also elements of the building that can be considered as passive like fire doors and fire-resistant walls and ceilings, this is known as compartmentation. How to remove or reduce fire risk in the workplace? Preventing fires can be achieved with a few simple changes. It comes down to practicing good housekeeping skills in the workplace. Having an area that is free of rubbish and mess will prevent fires from starting and spreading as they are potential sources of fuel. Bins should be emptied often. Bins placed outside should be secure, 5 metres away from the building without overflowing rubbish and collected regularly. Fire exits and escape routes should never be blocked or used as a storage space. It will prevent a safe and quick evacuation or encourage fire spread using the items as a fuel source. 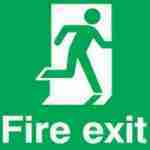 Make sure that fire exits are seen clearly and call points are easy to get to without any obstruction. Winters in the UK can be unforgiving, but workplaces should be kept warm enough for everybody. 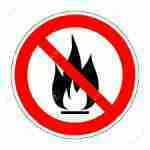 Good fire protection practice is avoiding portable electric heaters if possible. If they are needed then make sure the heater has an internal thermostat that automatically switches itself off when it reaches a certain temperature or place a timing plug on the heater that will switch off when programmed to do so. Never place anything directly on the heater or around it, especially sources of fuel like a rubbish bin. 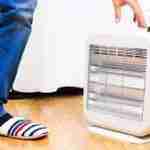 Do not place the heater where it can be an obstruction or potentially knocked over. Despite a UK smoking ban in 2007 reducing the risk of fires, a large amount of fires in the workplace are still caused by smoking. Employees should be made aware of any smoking shelters where smoking is acceptable. Smoking shelters will help curve temptation of smoking inside, especially in bad weather. Damage to the actual plug. Signs that the plug has overheated like melted or deformed plastic and burn marks. 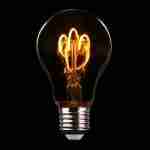 If you notice any of these, then have a qualified electrician take a further look. Never ignore the problem or try to figure it out yourself. Do not overload the extension leads and potentially exceed the current rating for the lead or overload electrical sockets. Just because there are four sockets available does not mean you should use all of them. Do use gang leads instead of cube adaptors if you need to use more than one plug per socket. The cube adaptors are prone to overheating. Also, ensure all plugs have the correct fuse and that all electrical equipment not being used is unplugged. Arson is the number one cause of workplace fires. We cannot predict human behaviour, but there are measures that can be put in place to help deter arsonists. Security – will stop someone from gaining access to the building. This can include hired security guards, fencing, outside lighting and CCTV. Even a sign mentioning that this area is watched will deter an opportunistic arsonist. If there are any openings in the building, such as a letterbox or vent, consider putting a mesh over these gaps. 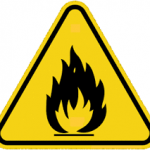 Keep combustible items like boxes and storage away from doors and windows. Secure skips with a lock and keep them at least five meters away from the building. 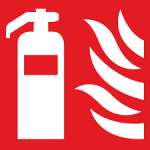 There are fire safety signs that should be put up in and around the building to let people know what to be aware of. Prohibition – Bold red circle with diagonal line through the middle from top left to bottom right on a white background. This means something is not allowed. No smoking is the most common one. Mandatory – Bright blue circle with white wording or symbol. This tells people what they must do, like keeping a fire door shut instead of keeping it open. Information – Square or rectangular shaped sign that is red with white writing and/or symbols. These can tell someone where something is located in case of an emergency. Warning – Attention-grabbing bright yellow with black border to alert passers-by of potential dangers. Safe Condition – Green rectangle with white writing/symbols indicating safe points. How to design fire protected environment? Fire doors play a critical role in containing fires. They are designed to hold back a fire for thirty or even sixty minutes. 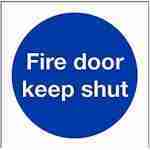 Fire doors need to be kept shut at all times and are marked with a mandatory ‘fire door keep shut’ sign. Others are held open with a magnet. This magnet disengages in the event of a fire alarm, automatically shutting the door to help contain any fire. If any fire door is kept open with a wedge, then it is no longer serving its purpose. Be sure to test your fire door system regularly. An area of relative safety leading to absolute safety. This is an essential part of the fire safety system. A safe, illuminated, well identified way out of the building is required in order that the people within the building can escape a fire (or other) emergency. 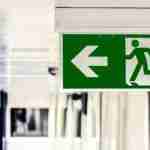 Often more than one escape route is required so that occupants have an alternative exit if one cannot be reached because of smoke or fire. These exits must be kept clear at all times. Storage of materials in exits is a common hazard and security problems are often overcome by illegally locking fire escape doors which places the lives of the building occupants at risk if a fire occurs. Buildings are now being built as small compartments with fire-resistant walls, ceilings and doors. This practice of compartmentation helps contain fires and allows people to move safely whilst containing the fire. No matter where someone is in a building, they should be able to spot a green escape route sign indicating the safest way to go in the event of a fire. They should be above doorways, dotted along the escape routes and in any other areas deemed suitable. These signs have arrows pointing in the direction of safety. Sometimes they will have writing explaining that it is a fire exit, but new EU directives have changed these to just symbols. In addition to the signage, floor plans with marked escape routes should be displayed in every room. These floor plans also help firefighters find the fire and where alarms have been set off. Make sure the plans are up-to-date and check them regularly during fire safety checks. All escape routes need to lead to an exit that opens outward into a safe area. It can be a door that is already in daily use or one dedicated for emergencies only. They can be locked when the building is not in use, but they need to be unlocked once someone is in the building. There needs to be sufficient signage indicating which exits are fire exits and that they should be kept clear. The exits need to be free from obstruction on the inside as well as anything outside preventing it to be opened fully. If the electricity were to fail for whatever reason, emergency lighting should be activated with power from batteries or a generator. It often isn’t very bright, but it is sufficient enough to catch attention and guide people to safety. Emergency lighting can include illuminated signage as well. It is always a good idea to have staff and visitors sign in upon entering the building and out when leaving. 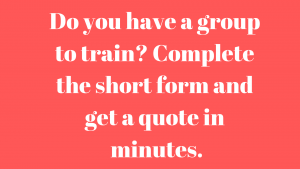 You can appoint someone to take responsibility of the book or tablet and grab it on the way out of the building during an evacuation and use it to make sure everybody is accounted for. As a visitor to a premise, there are a number of things to consider. In a building with a good level of fire safety management, relevant information will likely be given to a visitor by on-site notices, signs or perhaps even a few notes on the back of a visitors pass. Time is essential in the control of fire. Automatic sprinkler systems are one of the most reliable methods available for controlling fires. Today’s automatic fire sprinkler systems offer state of the art protection of life and property from the effects of fire. Sprinkler heads are now available which are twenty times more sensitive to fire than they were ten years ago. A sprinkler head is really an automatic (open once only) tap. The sprinkler head is connected to a pressurised water system. When the fire heats up the sprinkler head, it opens at a preset temperature, thus allowing pressurised water to be sprayed both down onto the fire and also up to cool the hot smoky layer and the building structure above the fire. This spray also wets combustible material in the vicinity of the fire, making it difficult to ignite, thereby slowing down or preventing fire spread and growth. When a sprinkler head operates, the water pressure in the system drops, activating an alarm which often automatically calls the fire brigade via a telephone connection. Sprinklers can cause water damage, however, only those sprinkler heads heated by the fire operate; all sprinklers in a building do not operate at once. Usually non-fire water damage only occurs if the occupants carelessly damage the system. Firefighters use much more water than a sprinkler system. The combined damage from a fire and the water used by firefighters dramatically exceeds that likely from a properly installed sprinkler system. Because, historically, complete extinguishment of fires has not been achieved, it is traditional to consider that sprinklers only control fire growth until intervention occurs by the fire brigade. Today, some sprinkler systems are designed for early suppression and are considered to have failed if they do not extinguish the fire. Sprinkler systems are usually installed in high or large buildings and high fire hazard occupancies. Statistics show that in a majority of cases where sprinklers are installed the fire has been controlled by one sprinkler head alone. Not all alarm systems are suitable for all types of workplace. There should only be an alarm system in place that is suitable for the building. If there is a fire anywhere in the building, everybody in that structure needs to be alerted. In small buildings with a couple rooms and a few employees, sometimes only communication between employees (such as shouting “Fire!”) or an air horn is enough to grab attention. In larger office buildings that may be quite a few storeys high, then a larger sophisticated alarm system should be put in place. There are a variety of different fire alarms on offer. Small, low risk office spaces with just a few employees can have a simple smoke detector alarm system. Medium risk, larger premises usually have call points that can be activated manually through a button or switch in addition to smoke / heat detectors. More high-risk, complex buildings will often have automatic fire alarm systems that activate a variety of different fire safety systems. i.e Smoke curtains will drop, fire doors will close, locked doors will open, lifts will ground and a public address voice alarm (PA/VA) will help guide the occupants to safety. Foam systems – Foam systems are ideal for areas that have flammable liquids. The foam works in two ways, by stopping the fire and reducing the chance of it re-igniting by controlling the build-up of vapour in the air. Hose reels – Hose reels are connected to a water supply, ensuring a lot of water available as soon as it is needed. These need to be strategically placed though, since they can have a limited range, be a trip hazard and keep open fire doors. They can be difficult to manage and should only be used by trained persons. 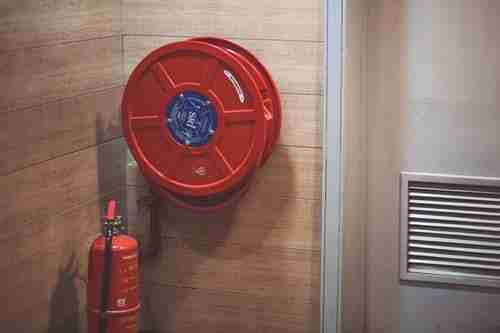 A hose reel has a constant flow of water and the danger is that the person operating it will be concentrating on the flames of a fire and not realise that the smoke and hot gases have built up around them concealing the fire exits. Gas flooding systems – A gas flooding system is only appropriate in rooms where people would not normally be, like in an electrical room. An alarm will go off beforehand just in case to alert people to get out. It will then fill the room with carbon dioxide, a gas that will smother a fire. Wet and dry risers – These vertical pipes are found on high-rise buildings and are for firefighters to use. Wet risers are attached to water sources and are ready to go at a moment’s notice while dry risers are empty and will fill with water when needed.